Organiser: The contest is hosted by University of Engineering & Management, Kolkata. 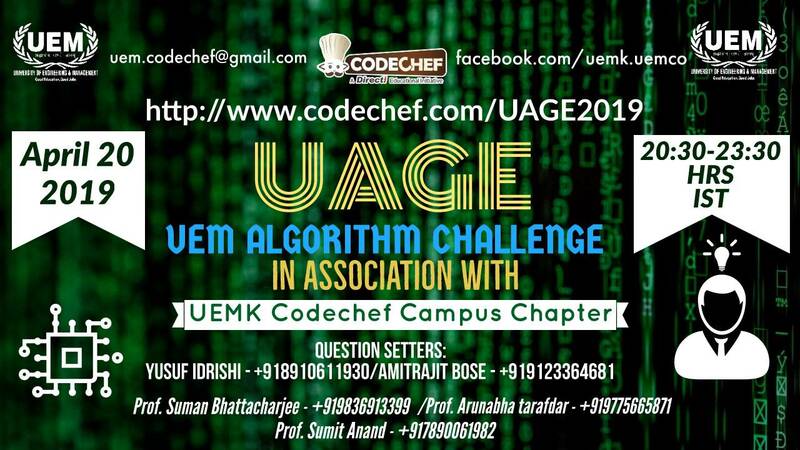 Please contact uem.codechef@gmail.com for any queries during the contest. UEMALGO1 (Play Carrom) : The question statement has been slightly updated. UEMALGO3 (Graph Life) : The question statement has been updated, added clarifications. UEMALGO2 (Knockout Jump) : The question statement has been slightly updated, typo fixed.